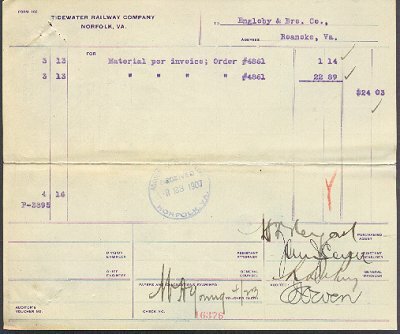 1907 Railroad Shipping Bill - Tidewater Railway Company. (384) 1907 Railroad Shipping Bill-Tidewater Railway Company, Norfolk, VA.-Condition: Good + Outside cover has the Name of Railway Co., Name Bill was made out to, and what was sent and cost. Inside of bill is, Invoice number of 2 items, total cost, Signatures of Purchasing Agent, Asst. Treasurer, Gen. Manager, Auditor, and Examiner of Papers! Total for shipping (stock) was $24.03. Size (opened) 7" by 8 1/4". Some discoloring of Fold. Staple holes at top left. Bill is folded like a Certificate. Price: $6.00 + shipping.